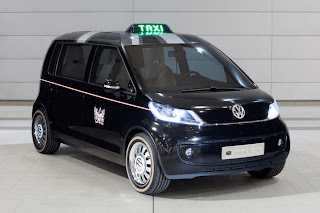 A conceptual twist on a British institution has been unveiled in the form of the Volkswagen Taxi Concept – the latest evolution in a series of 'World Taxis' based on the underpinnings of the forthcoming UP! city car. The man behind the project, Klaus Bischoff, Head of Design at Volkswagen, was present in Central London earlier today to unveil the car. 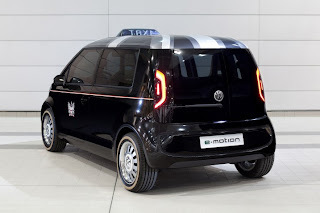 Designed to meet the challenges faced by vehicles in modern cities, with ever tighter restrictions on space and emissions, the Volkswagen Taxi Concept is powered by an electric motor fed by lithium-ion batteries. With a capacity of 45 kW/h the batteries allow the electric motor to generate a maximum power output of 115 PS, translating to a theoretical top speed of 74 mph. The range of the Volkswagen Taxi Concept is estimated at 186 miles between charges with an 80 per cent charge taking around one hour to complete. 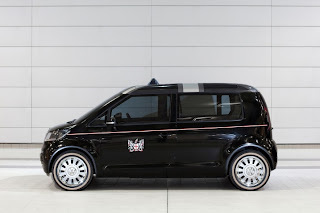 The Concept, which measures 3,730 mm in length, 1,680 mm in width and 1,600 mm in height, is shorter than the current smallest Volkswagen, the Fox. However its long wheelbase and minimal front and rear overhangs allow it to have a spacious cabin with room for two adults to be seated in comfort plus an allocated area for luggage. At the front, the driving environment is similarly spacious, an impression emphasised by the large glass area. The theme running throughout the vehicle is simplicity, with an elegant, clutter-free look to the interior. The major functions of the vehicle including climate, entertainment and fare information are all grouped onto one touchscreen display mounted next to the driver. In the back a similar screen relays information to the passengers on their route and their immediate environment. Despite its modest size, the Volkswagen Taxi Concept feels luxurious, with use of cream leather and individual, as opposed to bench, seats. The styling draws on that of the UP!, Space UP! and Space UP! Blue concept cars and features deliberately tongue-in-cheek details such as the silver Union Jack on the roof and the City of London's coat of arms resplendent on either side of the vehicle as well as on the dashboard. 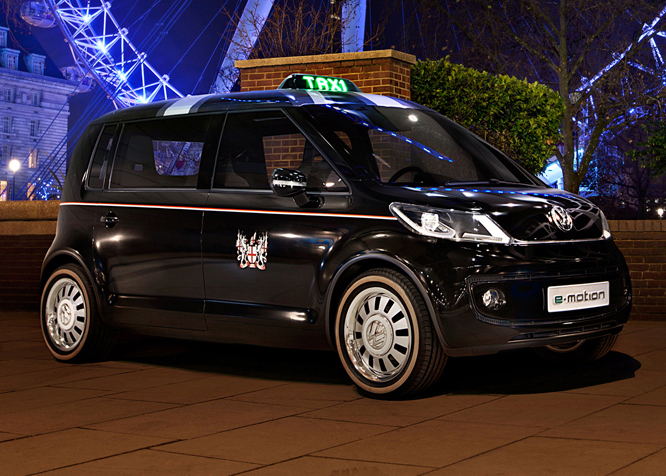 Elegant daytime running lights mounted within the headlight units are joined by a distinctive 'Taxi' light on the roof. This has two settings – it glows green, indicating when it's free and red when it's not. At the rear the light units are integrated into the 60:40 split tailgate, behind which are a pair of cubbies to house the belongings of the driver. 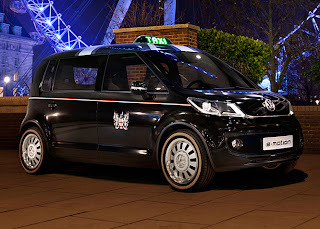 While the concept doesn't adhere to current legal requirements regulating taxis in London it does offer an insight into the possibility of a future small, efficient taxi that offers an alternative to conventional fuels.